Now that the days are so much shorter, if I don't get a picture on the way to work, or remember to go get one at lunch, I'm fairly out of luck without having to resort to the flash. Yesterday was not a good day, so I was stuck with this - photographic evidence of my dorkitude! Today's photo - Jesus with his holy roller - was found inside an entry to an underground garage for RMIT, in a little no-name alley off Little LaTrobe St.
Never deny any geekiness, dorkiness or general whackiness. It's in fashion now. Maybe the expected weather nastiness on the weekend might produce some photographic opportunities. Near our place there is an old mansion surrounded by elms. The wrought iron overgrown gates, gothic windows and rusty colours of the leaves, makes me wish I had more than a point and shoot camera and a bit of talent. Hah! No fear. I've always embraced the inner dork. No point in avoiding it, I'm not very good at being anything other than myself. Awesome robot! 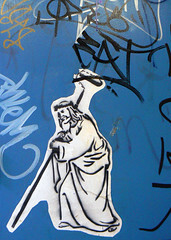 And Jesus cleans up graffiti now? Does he do windows? Yeah, I'm very fond of the robot. I bought him in Rothenburg, in Germany. And you know Jesus, he does a little bit of everything. Look forward to seeing some more of yours! Hope you're feeling a bit better.